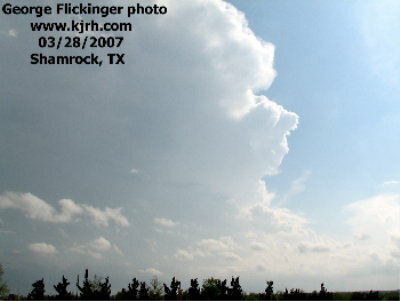 A small thunderstorm develops near our prelim chase target of Shamrock, TX. We leave this weak storm and drive southward toward more significant development. 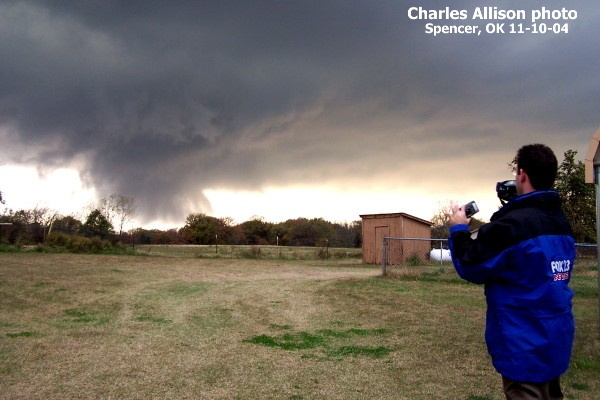 Tornadoes, lots of them: what began as a test run and training session for my TV station's "Storm Chaser 2" ended with our tornado video broadcast on the NBC Evening News. Rick Tillery and I witnessed 4-5 tornadoes. 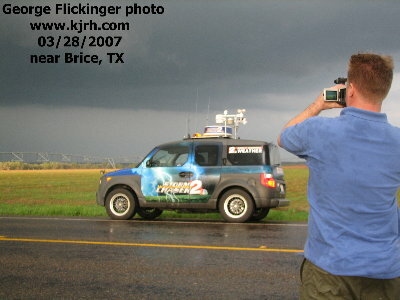 South of Brice, TX on Highway 70, we spot a well defined wall cloud organizing north of Silverton. 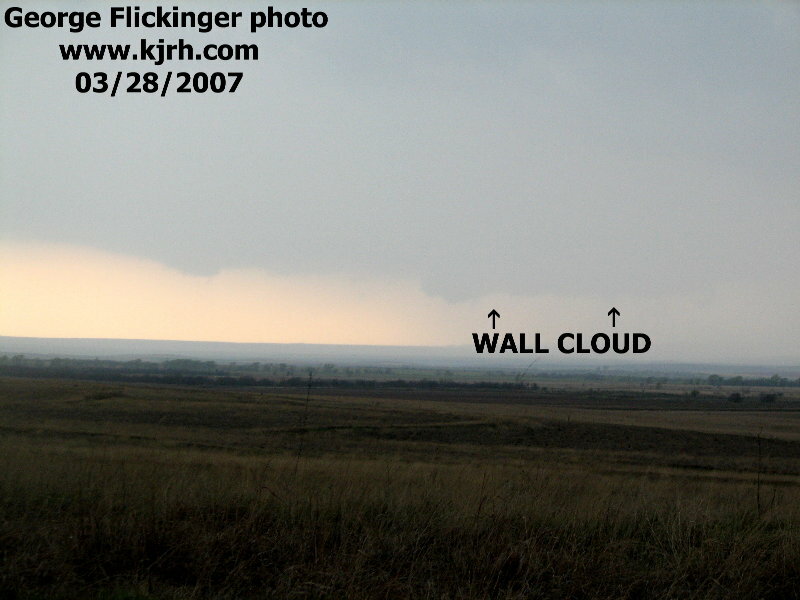 Notice the impressive clear slot left of the wall cloud. 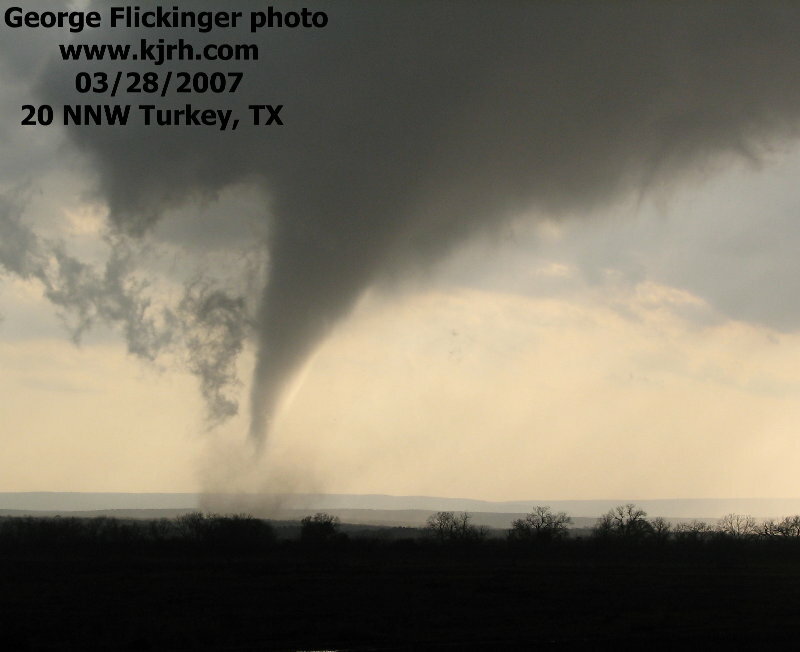 Earlier, another tornado occurred. Tornado. It's formed to our southwest. We're driving thru quarter size hail and in perfect viewing position. Beautiful tornado. 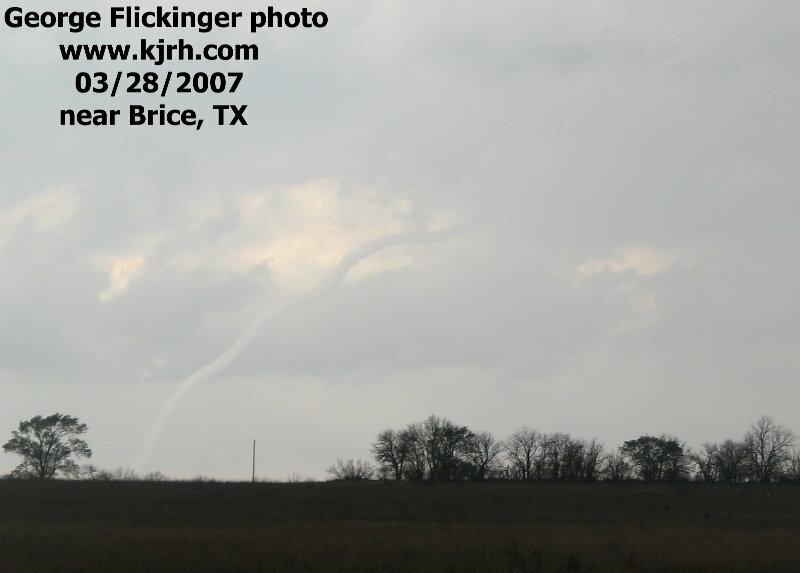 Note the dusty debris whirl under the visible funnel. 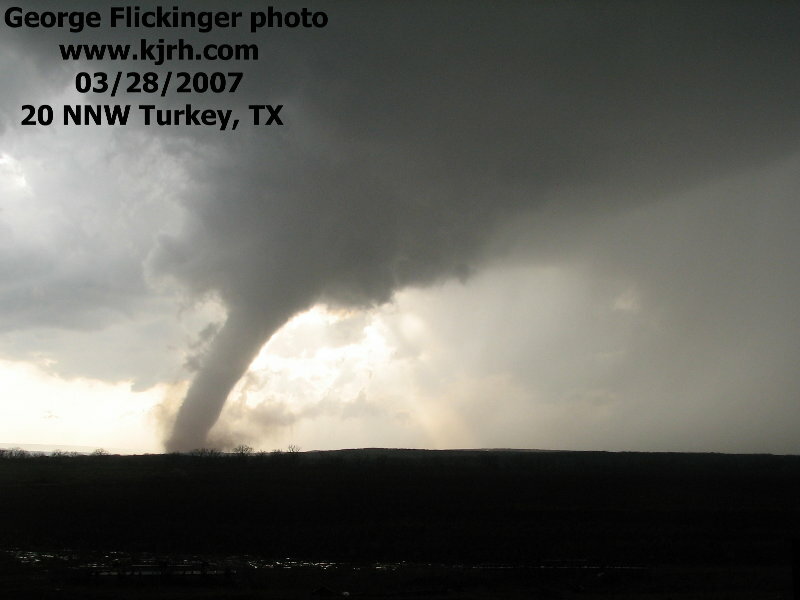 This tornado is churning across the Red River and rugged Palo Duro Canyon north of Turkey, TX. 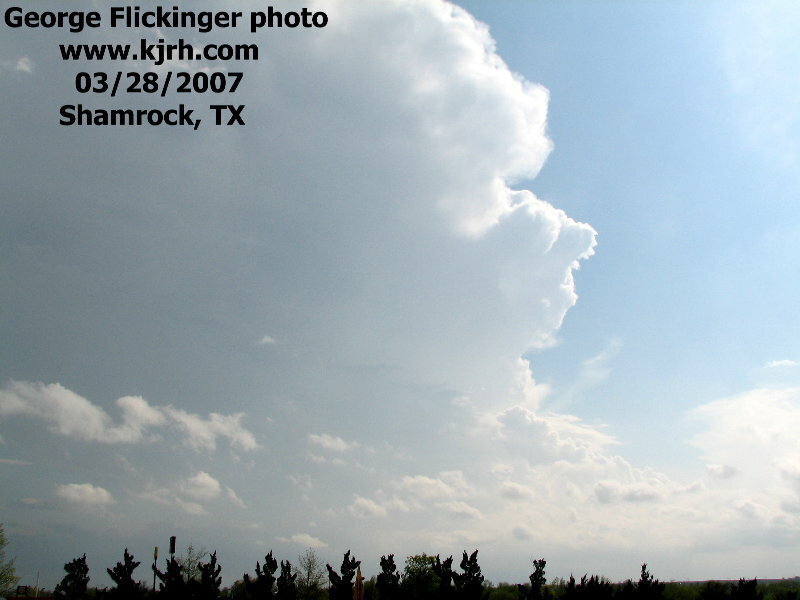 You can see the Caprock elevation rise in the background. 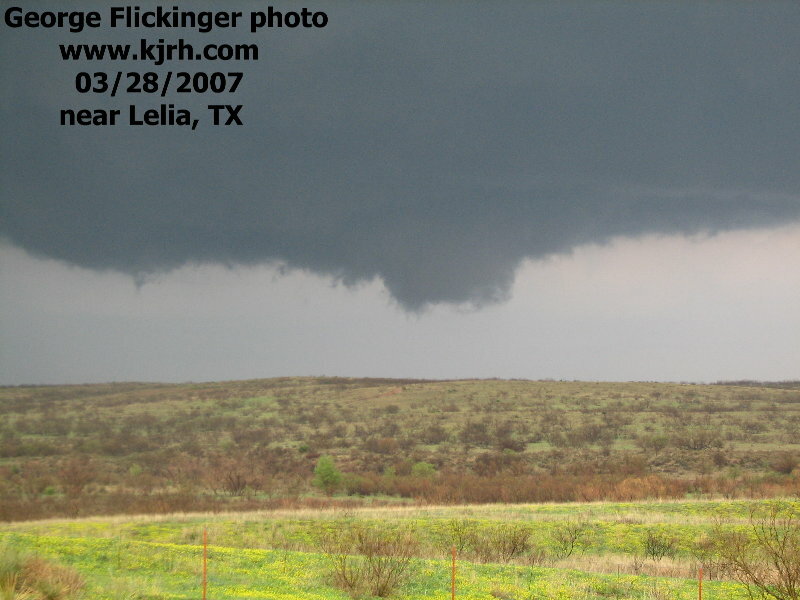 Tornado is probably about 100 yards wide at the base. It's moving from left to right in this view from our view. We're about 2 miles away. The "mature" stage. 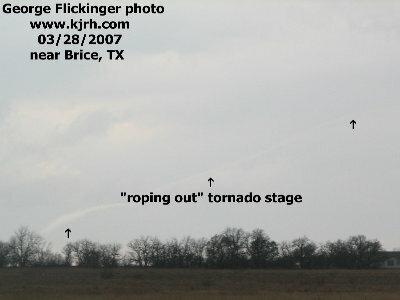 Why does this tornado look "chopped off"? Because there's a huge elevation rise in front of us! 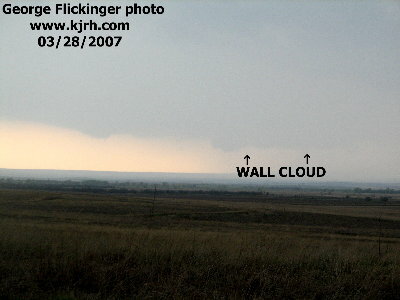 The tornado then climbs the huge hill as it moves up the canyon wall. After the tornado reaches the hill top, it weakens. 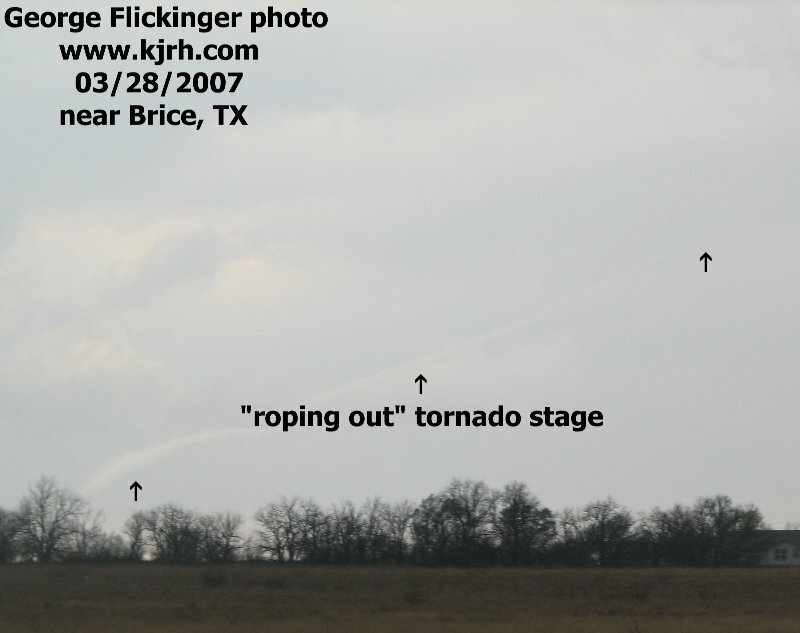 This photo series again proves that topography has little to no impact on where tornados form and track. Still ropin' the wind...the funnel shrinks as the tornado is near death between Brice and Clarendon near Highway 70. 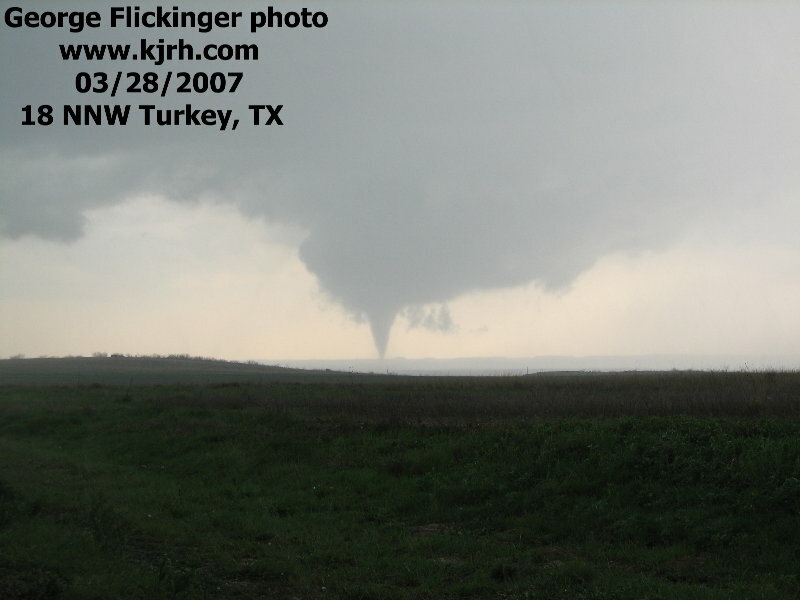 This tornado formed in the Red River Valley, then climbed the edge of the Palo Duro Canyon before weakening. 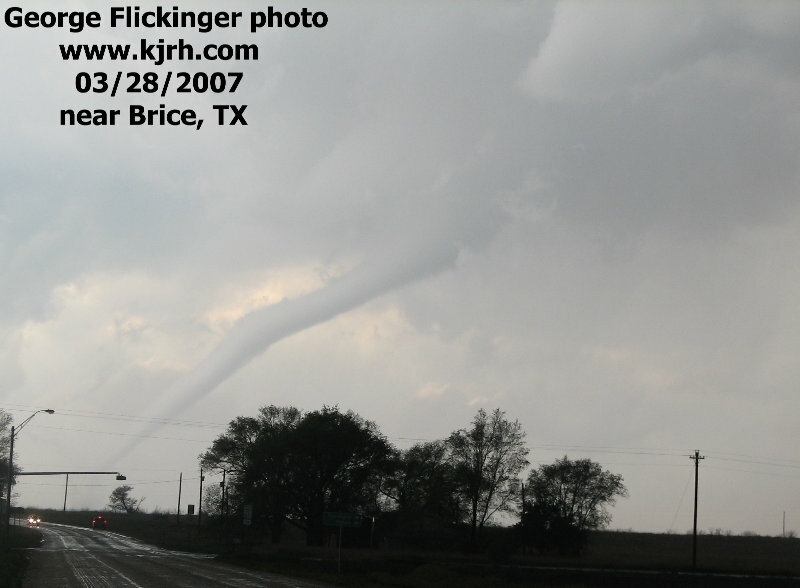 ...and quickly looking back westward, I snap this picture just seconds after the previous photo of Rick-- the tornado maintains a small circulation! Now looking back east at the newer storm, strong inflow winds blow tumbleweeds across the field. The next tornado forms soon. 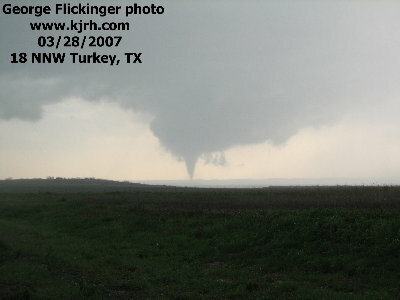 Tornado looking eastward. 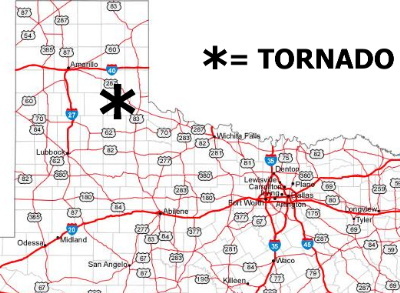 Due to few road options we're stuck west of the tornado. Rain wraparound lowers our visibility. The other tornados we saw occurred at night. "X" marks our spot. 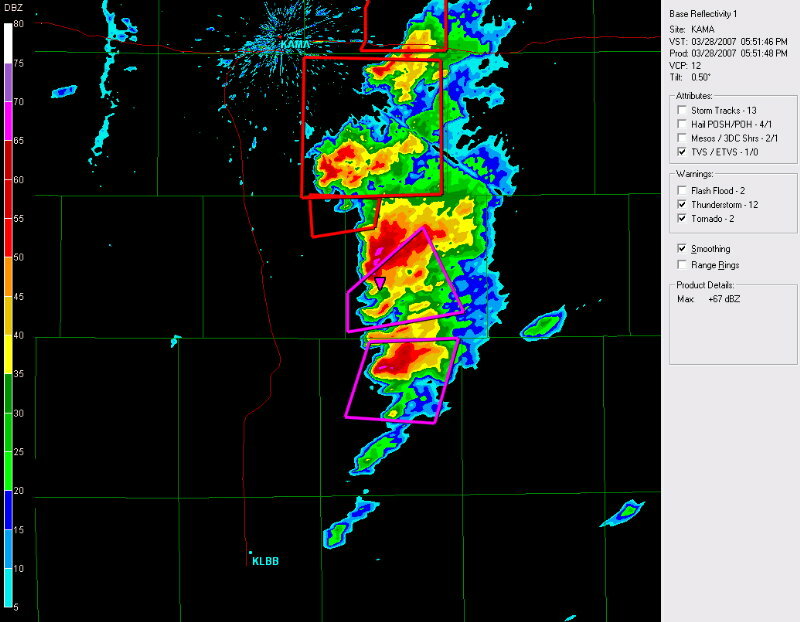 The main tornado shown below occurred from the storm approaching us from the SW.
image courtesy: Amarillo NWS Nexrad radar. 17MB Video download of tornado. 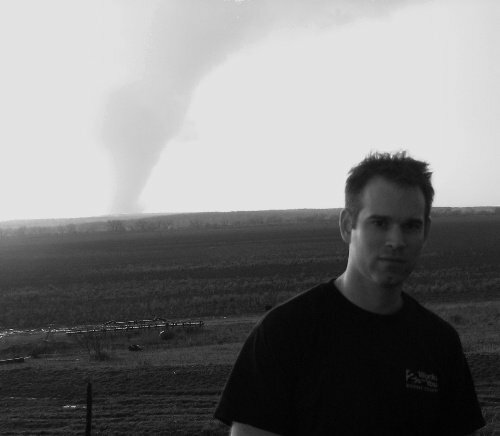 Tornado movie download. Turn up your speakers to hear the cows complaining! NOTE: You can click on the pics below to view them LARGER. We drove to the Texas Panhandle from Tulsa. 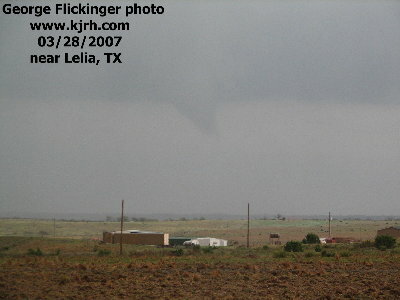 Little to no damage occurred with the main tornado as it tracked in open country between Amarillo and Childress. 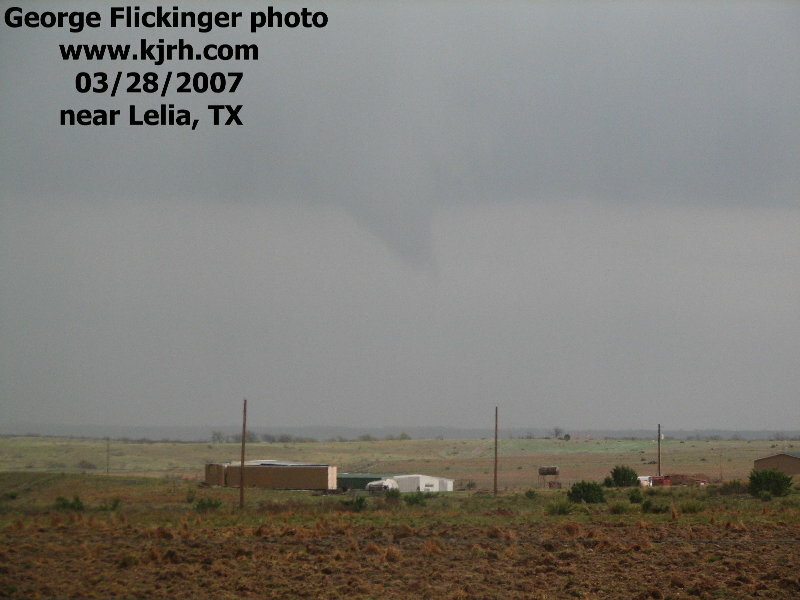 The tornado actually formed in the Palo Duro Canyon. I took the pictures below. 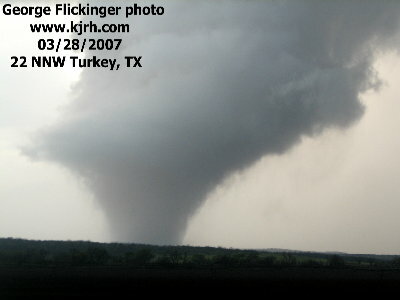 You may have seen them in a national publication as they were donated to a charity for tornado victims. The video appeared on the NBC Evening News. 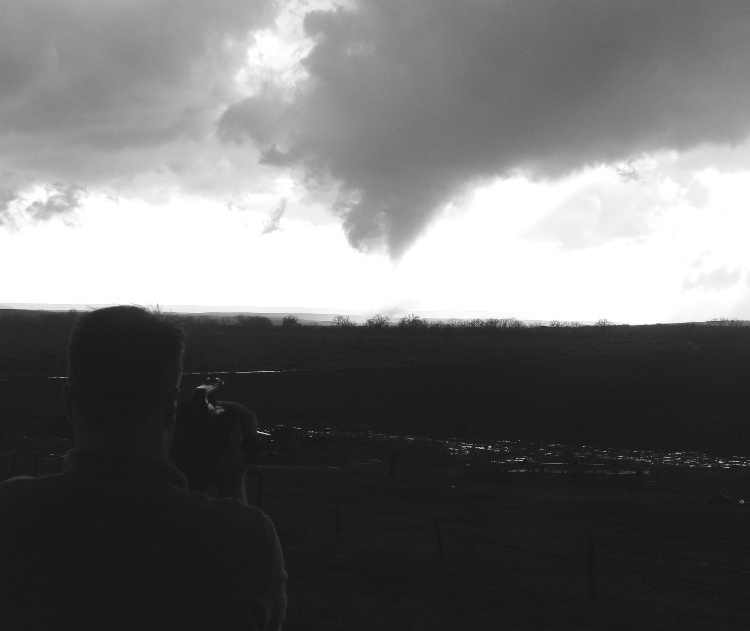 Contact me if you need assistance or need pictures for storm spotter training.